We continue with Volunteers’ Week during which we are saying an emphatic THANK YOU to every single person who has offered their time and expertise over the past year to UCL’s SCAR department, without whom many a project would have been difficult or even impossible to complete. There are a wide range of roles that volunteers can take up within SCAR: helping with events, sorting through new collections, enhancing cataloguing, assisting in exhibition preparation, helping with our media and online communications. Throughout Volunteers’ Week we intend to share a snapshot of some of these roles with you. Each week day from 1st June to the 7th June, a guest volunteer writer will bring you a ‘day in their life’. 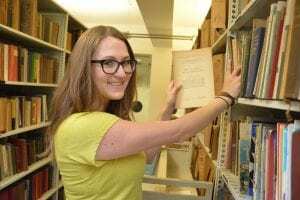 The third installment comes from the two volunteers, Ashley Zuelke and Teodora Lazar, working on the Lauwerys Collection at the Institute of Education Library. Ralph Waldo Emerson once wrote: “If we encountered a man of rare intellect, we should ask him what books he read.” At UCL Institute of Education (IOE) Special Collections and Archives we are building a picture of Joseph A. Lauwerys and his life by listing all of the reading material in his personal library. I am one of two volunteers sifting through 28 double-stacked shelves full of books, academic journals, newsletters, meeting proceedings and more collected by Lauwerys, a Belgian-born scientist who became a leader in comparative education studies instrumental in the establishment of the (IOE) and the United Nations Educational, Scientific and Cultural Organization (UNESCO). Lauwerys’ life spanned 79 years, from 1902 to 1981, and the fraction of the books we have listed thus far illustrate how world wars and subsequent multinational collaboration and scientific advancements shaped his perspective. On a given day working with the collection, one comes across material published in more than eight languages on subjects ranging from chemistry theory, to morality, to educational systems in Chile. We note the details of each piece and scan them for marginalia, to see what he found important. Lauwerys’ collection considers all levels of education. Some of the earliest pieces appear to be his own textbooks. He also kept some publications of his speeches and journal articles, especially those published in multiple languages. In addition to writings on science and educational theory, he kept items like yearbooks from the USA and memorial programmes for colleagues. 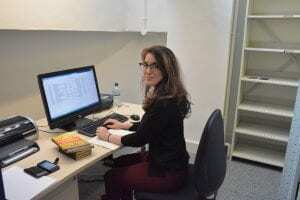 I am Teodora, one of the volunteers listing all of the reading material in Joseph A. Lauwerys’ personal library. I cannot tell which reason influenced me to work with the IOE’s Special Collections and Archives more: my studies in Art History and Material Studies which, by default, bring me closed to any piece of heritage and culture, or my passion for volunteering, which constantly challenges me to step beyond my comfort zone. But I know for sure that the mixture between these two reasons always manages to get me closer to who I want to be. It goes without saying that the valuable work that Ashley and Teodora are doing will benefit future researchers. So a BIG thank you, Ashley and Teodora! We hope that the experience you gain from this will help you too in the future.